The Prefect of the Congregation for the Causes of Saints, His Eminence Cardinal Giovanni Angelo Becciu, Representative of the Holy Father, will preside at the beatification ceremony of the Venerable Tullio Maruzzo, priest of the Order of Friars Minor, and Luis Obdulio Arroyo Navarro, layman of the Third Order of St. Francis of Assisi and catechist, Saturday 27 October 2018 in the city of Morales, in the Apostolic Vicariate of Izabal (Guatemala). 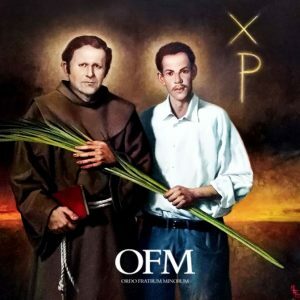 The martyrdom of the two new blesseds took place in the area of Los Amates, Quiriguá, in the Apostolic Vicariate of Izabal – Guatemala on the evening of 1 July 1981. At the end of an intense day of apostolic work, Father Tullio decided to fulfil his last commitment by presiding at a meeting of the Cursillos de Cristianidad. The catechist Luis Obdulio offered to accompany him as driver. Both were conscious of being persecuted for the work of evangelization and promotion of human rights carried out by the Church on behalf of the poor, and had previously received explicit threats. The preaching of truth and of evangelical justice was considered to be a subversive activity by the political regime. On the way back, the car in which Father Tullio and Luis Obdulio travelled was blocked near a banana plantation. The two were forced to get out at gunpoint, were shot and killed, and abandoned at the side of the road. Father Tullio Maruzzo (Lapio-Italy 1929) had gone as a missionary to Guatemala in 1960. He belonged to the Province of the Friars Minor of Veneto. He carried out his pastoral activity in the parishes of Puerto Barrios (1960-1963), Entre Rios-Abacà (1963-1968) Morales (1968-1980) and Quiriguá (1981) in the Apostolic Vicariate of Izabal. In this vast territory, amid difficulties of all kinds, he expanded his missionary action to reach the most remote villages. He had a calm and patient character as well as a profound piety and a caring charity towards the poor and the sick. He had the gift of being able to welcome everyone, and to take particular care of the formation of the area catechists, the Delegados de la Palabra, for the service of the various communities. Luis Obdulio Arroyo Navarro was born in Quiriguá (Guatemala) in 1950 from a modest family. Having worked for a while as a mechanic in Puerto Barrios, he accepted a job as driver at the town hall of Los Amates. At the age of twenty-six he joined the Franciscan Third Order, also becoming a catechist. Later, in deepening his own journey of faith, he participated in the Cursillos de Cristianidadmovement, which Father Tullio had introduced into the parish of Quiriguá. He was a mild and helpful man, who willingly put his time and his abilities at the service of the parish community, acting as a free driver and helping out with manual work which he was particularly good at. The cause of beatification of the two martyrs, promoted by the Venetian Province of the Friars Minor, began in 2005. The body of Father Tullio and later that of Luis Obdulio were moved to the parish church of the Sacred Heart of Jesus of Quiriguá where today they are revered as blessed.